For football- and country-loving Baylor fans, it’d be hard to top Friday night for pulse-raising spectacle on campus: There’s the Traditions Rally that kicks off the first home game. A free concert by country star Brad Paisley. And fireworks. Those Friday night stars aligned for Baylor University when Paisley selected the school as one of four early venues of his “Country Nation College Tour Presented by Zaxby’s,” which kicked off Sunday at Virginia Tech. It all takes place on Baylor’s Fountain Mall at the heart of campus, and although there is seating for only about 3,000 people in a grandstand erected near Moody Library, Baylor officials said there is room for a crowd of 10,000 if they stand or sit on the grass. Friday’s Baylor concert marks the first Central Texas appearance in years for the 42-year-old Paisley, who soared to country stardom in the early 2000s with hits like “It Didn’t Have To Be” and “We Danced” after several years as a Nashville songwriter. He has sold more than 12 million albums since then and remains one of country music’s most popular stars. His 8:30 p.m. concert appearance comes in the middle of Baylor’s Traditions Rally, held before the school’s first home football game. Baylor opens its home season at McLane Stadium on Saturday night against Lamar University. 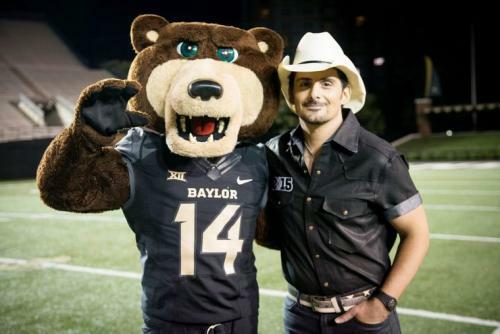 His Baylor “Country Nation” show doesn’t take place in McLane Stadium, the site of last year’s Traditions Rally. With rally/concert access limited to four gates and much campus parking reserved for Saturday’s home football game against Lamar University, campus officials are recommending parking at the Ferrell Center and taking a free shuttle to campus with a drop-off site near Moody Library. Much of the evening’s action and performances will take place on a portable stage on the south end of Fountain Mall facing Moody Library, with the anticipated crowd filling the space between. The pep rally starts at 7 p.m., with country comedy band the Raging Idiots featuring iHeartMedia radio personality Bobby Bones opening at 7:30 p.m. for the West Virginia country star. Paisley and his band will perform for about an hour, with a fireworks show above Pat Neff Hall concluding the evening. Those attending the rally and show must enter through four gates, two on Third Street in front of Moody Library, one south of Marrs McLean Science Building and one south of the Sid Richardson Building. Gates open at 5:30 p.m.
Standard stadium restrictions apply. No food, drink, alcohol, backpacks or large purses and bags will be allowed. Blankets and lawn chairs for seating also are prohibited, with first-come, first-served grandstand seating the only seating optionother than the ground. Parking is limited, due to several of Baylor’s parking garages being closed for gameday parking, while student and faculty vehicles will fill other parking garages and on-campus spaces. Shuttle buses will run every 15 minutes from 4:30 p.m. to midnight from the Ferrell Center to a stop near Moody Library.